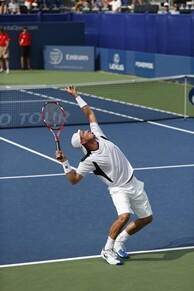 Lleyton Hewitt serves his way to a victory on Stadium court. Usually, the way the tale goes, is that either the scruffy old veteran or the upstart young gun wins in the end. Wednesday, it was both. Lleyton Hewitt, a two-time Grand Slam champion and the No. 7 seed at the BB&T Atlanta Open, showed his patented brand of rugged grinding to defeat wild card American Rhyne Williams 7-6(6), 6-4 on Stadium Court to advance to the quarterfinal round. Just behind the Australian vet, on the AJC Grandstand Court, another American wild card, 373rd-ranked 19-year-old Christian Harrison showed poise beyond his years. In his first main draw match on the ATP World Tour, he beat Colombia’s No. 1 Alejandro Falla 6-1, 6-7(7), 6-2. Ranked only No. 373, the 19-year-old beat the player who is 290 spots above him in the rankings. Each match featured a pressure-packed tiebreak, but the meaning of that extra frame proved very different within the course of either match. Hewitt had a chance to serve for the first set, up 5-4, but Williams fought back to even it and eventually force a tiebreak. In the deciding frame, Williams went up 6-2 only to waste four straight set points. After the changeover, Hewitt got his first set point and didn't blow it, volleying it home to clinch the set with a patented shout of "Come on!" The two stayed neck-and-neck in the second, but as Williams served to stay in the match at 4-5, Hewitt broke him for the win instead. On the adjacent court, Harrison, the younger brother of 132nd-ranked American Ryan, quickly went to work with a 6-1 opening-set win against the 83rd-ranked Falla. Harrison won 83 percent of his first serve points and was 2-for-2 on break points in the set. In the second, the players locked in and fought through a grueling tiebreak, which Falla pulled out with two straight points after Harrison evened it at 7-7. If Falla was looking to steal the momentum, though, it was not to be. Harrison rebounded like a veteran, serving to go ahead 3-2 and then reeling off another three consecutive games from that point for the victory. Harrison fist-pumped to the raucous crowd after Falla's final forehand sailed long. Harrison was a perfect 4-for-4 on break points in the match. He'll have a truly tall task ahead of him in the second round, getting the event's top-seed John Isner on Thursday. Soft-spoken giant Ivo Karlovic, fresh off his tournament win in Bogota last weekend, took on another Australian veteran in action, Matthew Ebden. In what looked like a mismatch, the two-time and defending BB&T Atlanta Open doubles champion Ebden notched the upset victory after Karlovic retired with fatigue after dropping a listless first set 6-2. The doubles tandem of American Rajeev Ram,a winner of the inaugural BB&T Atlanta Open double title, and Great Britain's Ken Skupski defeated fellow Brit Dominic Inglot and German Franky Moser, a 2011 doubles finalist in Atlanta. 6-4, 6-4 to advance to the quarterfinal round.